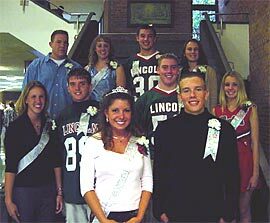 [OCT. 8, 2001] Four Lincoln elementary schools are among 170 Illinois schools now benefiting from a new reading tool recently launched by Gov. George Ryan. Kindergarten through third-grade students at Chester-East Lincoln, Jefferson, Washington-Monroe and Northwest Elementary schools are now bringing School-Home Links home to complete with their parents. All four schools are using the links as part of Solid Foundation, a comprehensive kindergarten through fifth-grade program developed and administered by the Lincoln-based Illinois Family Education Center. Teachers can assign the grade-appropriate School-Home Link as often as three times a week. Both parents and children are asked to work together to complete the reading activities, which will be kept by the teacher in the student’s portfolio. The School-Home Links were originally developed by Boston-area elementary schools in cooperation with the Boston Annenberg Challenge and the U.S. Department of Education. The Department of Education then asked the Illinois Family Education Center to field-test the links in 32 East St. Louis schools during the 1999-2000 school year. "The School-Home Links provide regular communication between teachers and parents about what a child is learning, prompt parent-child interaction at home, and extend learning time to build children’s reading skills," says IFEC Executive Director Sam Redding. IFEC is delivering School-Home Links to Illinois schools in a boxed form that eliminates the need for teachers to make copies. Illinois is the only state to use this system. The School-Home Links represent an integral part of IFEC’s Solid Foundation program, which assists 170 Illinois schools in engaging parents to encourage their child to build strong reading skills, consistent study habits, and to develop a sense of respect and responsibility for self and others. The Illinois Family Education Center is the parent information and resource center for the state of Illinois. IFEC is supported by the Illinois State Board of Education, U.S. Department of Education and the governor’s office. In addition to its Lincoln headquarters, IFEC also maintains regional offices in East St. Louis, Chicago Heights, Galesburg, Charleston, Vienna, Des Plaines and Rockford. You are urged to pass all five sections of the present GED exam by Dec. 31. In January 2002, a new GED test will be given and it will be necessary to start over from the beginning. Make your plans now to finish all five sections and get your GED. For orientation dates and registration information, call Heartland Community College, 735-1731. Milk and condiments are served with all meals. Students in grades three through eight may choose hot dog and bun or peanut butter and jelly sandwich in place of main entree. Students in grades six, seven and eight may choose salad bar in place of main menu.